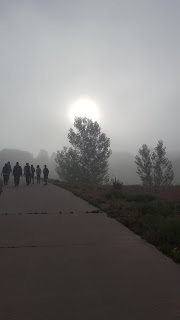 I loved this specific morning walk when weather was foggy and the Sun looked beautiful. Do you like it too? Wow, beautiful. Sun looks gorgeous in this click. I've always loved fog. Not fun to drive in, but walking is another matter. Its in neighbourhood park Shanaya. Yah Vineetha. That's my favourite part of the picture too. Even i love fog Alana. A foggy morning has its' beauty too! All we need is to have the eye to appreciate it and a grateful heart! This looks so beautiful... A lovely morning to start the day. Very beautiful .Nature is stunning! That's such a great find. Looks beautiful, Ramya. Thank you for joining! Wow! That is amazing.. Such views will certainly ensure regularity in the morning walks!